When Sony and Phillips ushered in the birth of the compact disc thirty years ago, the world was a very different place. The country where the first CD was pressed was called West Germany, and the world somehow entertained itself without Super Mario Brothers or Reddit. It's been so long since I have a bought a CD. Wait! Not true, I bought one a week ago at a Starbucks, of all places. Do people do that? Am I the first person to succumb to impulse buying of music at a coffee shop? Perhaps Starbucks sells more CDs than Best Buy these days. Doubtful, but according to the inter-webs, they sold 4.4 million CDs in 2008. "I came to have some fun." 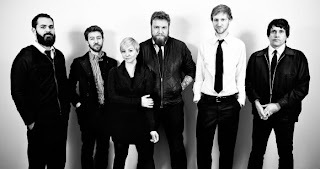 Communist Daughter is an American rock band from, where else but, Minneapolis, MN. A few years ago John Solomon walked away from music. After a long struggle with addiction and a brief stint in jail he broke up his critically acclaimed band Friends Like These and moved to a small town in Wisconsin. And supposedly that was that. Even though Solomon left music, music never left him. After a long hiatus, he called some friends to come to Wisconsin and demo up a new album.... now fiance Molly Moore, Adam Switlick, Jonathan Blaseg, and Al Weiers. If you already know who Communist Daughter is, perhaps you are Grey's Anatomy fan? I have never seen the show, but I feel like I have reviewed a dozen great bands who cite that as their jump into the mainstream. Enjoy this song off the bands latest EP, Lions and Lambs released this year in January. Look for a new album from Communist Daughter and even a new LP from Friends Like These very soon.